Understanding the mechanisms driving biological diversity remains a central problem in ecology and evolutionary biology. Traditional explanations assume that differences in selection pressures lead to different adaptations in geographically separated locations. This book takes a different approach and explores adaptive diversification--diversification rooted in ecological interactions and frequency-dependent selection. In any ecosystem, birth and death rates of individuals are affected by interactions with other individuals. What is an advantageous phenotype therefore depends on the phenotype of other individuals, and it may often be best to be ecologically different from the majority phenotype. 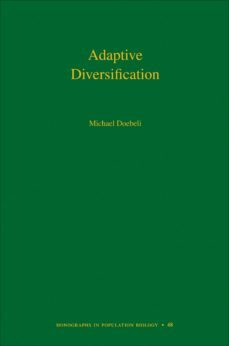 Such rare-type advantage is a hallmark of frequency-dependent selection and opens the scope for processes of diversification that require ecological contact rather than geographical isolation.Michael Doebeli investigates adaptive diversification using the mathematical framework of adaptive dynamics. Evolutionary branching is a paradigmatic feature of adaptive dynamics that serves as a basic metaphor for adaptive diversification, and Doebeli explores the scope of evolutionary branching in many different ecological scenarios, including models of coevolution, cooperation, and cultural evolution. He also uses alternative modeling approaches. Stochastic, individual-based models are particularly useful for studying adaptive speciation in sexual populations, and partial differential equation models confirm the pervasiveness of adaptive diversification.Showing that frequency-dependent interactions are an important driver of biological diversity, Adaptive Diversification provides a comprehensive theoretical treatment of adaptive diversification.